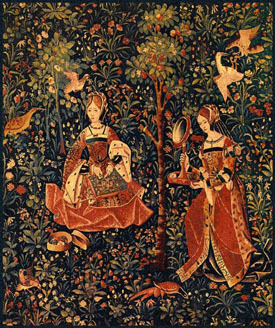 This tapestry represents a lady and 'Demoiselle' of company in a thousand flowers garden. The mistress embroides days of its youth while, her servant tends her mirror. The youth of these two figures have well been rendered by the painteress. Also exhibited at the Cluny Museum in Paris.